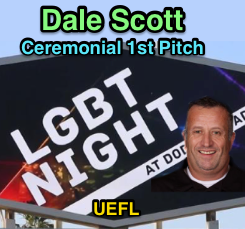 Out of retirement: Former MLB umpire Dale Scott will be back on the field this June at Dodger Stadium to throw out the ceremonial first pitch for Los Angeles' LGBT Night. Here's hoping the team selects a retired big league pitcher as honorary home plate umpire for Scott's pitch, which kicks off LA's June 8 game against the Atlanta Braves. Scott retired following the 2017 season, capping off an esteemed 32-year career in the American and Major Leagues, which featured 3,897 regular season games, 90 ejections, three All-Star appearances, and 22 postseason series assignments, including the 1998, 2001, and 2004 World Series. His career came to a premature end following a concussion sustained in Toronto in April 2017, his fourth game-ending head injury since 2012, and seventh overall exit during that span. Related Post: Dale Scott Retires in Wake of Concussion in Toronto (12/12/17). Scott was a crew chief for 16 MLB seasons. Scott, who served as the first active publicly gay umpire in Major League Baseball, was named UEFL Honorable Umpire of the Year in 2015, following his marriage to longtime partner Michael Rausch and feature article in SB*Nation's Outsports, whose motto is, "Courage is Contagious." Scott had first sent a photograph of himself & Michael to Referee Magazine to run alongside an article covering MLB's 2014 Opening Series in Australia, for which Scott served as one of four MLB umpire representatives, working as a crew chief during the Diamondbacks-Team Australia exhibition game and backup to Tim Welke during the two Dodgers-D'Backs games to kick off the 2014 regular season. Related Post: Dale Scott Comes Out as Gay After Feature Article (12/2/14). 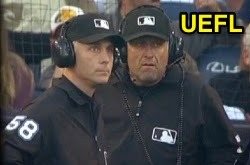 Related Post: 2015 Honorable Umpires - John Hirschbeck & Dale Scott (11/8/15). Former umpire Dave Pallone had previously alleged, in his book Behind the Mask: My Double Life in Baseball, that baseball unceremoniously forced him out of the sport following a 1988 New York Post story that outed the former NL umpire after 10 years and 1361 games in the big leagues. Pallone now serves as a motivational speaker concerning matters of diversity and empowerment, and is a member of The National Gay and Lesbian Sports Hall of Fame. Scott—who was also inducted into the Hall of Fame and whose own story was separated from Pallone's by decades—praised baseball for its support in the modern era. In a bit of trivia, Scott's June journey to the mound this June corresponds to where crew mate Jim Joyce called balls and strikes from when then-plate umpire Scott departed the March 5, 2015 Cubs-Giants Spring Training game due to a hand injury. Related Post: Dale Scott Exits with Injury, Joyce Umps Behind Mound (3/5/15). LGBT Night at Dodger Stadium is in its sixth year, and offers a special event ticket package for fans.